Many people have experienced the terrible, awful pain of plantar fasciitis. Once the pain train starts rolling, it feels like it can’t be stopped. If you have experienced this, you understand how desperate one can be to find relief from heel pain and a way to get back to walking and running normally. When you step out of bed, do you yell in pain then perform the “morning hobble” dance to the bathroom? Do you find yourself telling co-workers about this knife like sensation in your heel? Have you seriously considered walking on your hands? Is “ouch” the first word out of your mouth when you stand up? Are you reading WebMD articles about heel pain and looking at buying some ridiculously expensive shoe contraption to stop it? Does a sharp pain makes you scream at the beginning of a run, but disappears a few miles in? Have you made an appointment with your doctor to find out how much it is going to cost to amputate your foot? If you answered yes to any of these, unfortunately, you have diagnosed yourself with plantar fasciitis. Some people struggle with the pain on and off for years, which is why it’s so important to catch the pain early on. Local physical therapist Rebecca Wykle talked with us about what exactly is happening in the foot when plantar fasciitis pain flairs up and how to treat it before it gets too bad. By following a few basic care treatments, you can help the foot heal on it’s own and avoid getting to the point of seeing a therapist. It’s a really thick band of strong connective tissue that runs from the base of your toes down to your heel. It helps support the arch of the foot. When there's extra tension being put on that plantar fascia band, inflammation occurs at the attachment at the heel bone. So what you feel is a really sharp stabbing pain at the bottom of your heel in the fat pad. It's typically worse at the start of the morning when you first step down. Numerous things, but the root cause is usually that the area is being over used. Usually it can occur when you do something you don't normally do, or change up your routine. Did you recently add mileage to your training schedule, or go on a trip to Disney and walk a lot more than usual? Here are a few factors that can put you at risk: tight calves, excessively walking around barefoot, standing all day on non-supportive shoes, weak hips, over pronation, and obesity. Stop walking around barefoot. Wear a shoe with cushion and support around the house. When you wake up in the morning, instead of stepping down and stretching out the plantar fascia, slide into a pair of shoes with support so that you won’t tear or strain the tissues. Socks with sandals are cool, right!? We carry Oofos and PowerStep sandals, which both provide support and relief, come check them out! Stretch your calves. The plantar fascia is connected to the achilles which is connected to the calf. Poor ankle movement and tight calves can have an affect on the feet. Stretch your calves several times a day, holding for 20-30 seconds for 2-3 times. Strengthen the foot muscles. Strengthening the muscles of the posterior tibialis and the little intrinsic muscles can help support the foot. You can do that by sitting on a chair and picking up marbles with your toes or scrunching a towel with your toes. Use pressure to massage the foot to relieve the pain. There are two ways to do this: one, freeze a water bottle half full of water and roll your arch over it. This won’t fix the problem, but it will relieve some of the symptoms in the short term. Two, find a small ball like a tennis ball, or, even better, a massage ball and roll the ball under your arch and, if you can, around the heel. Starting and ending the day by rolling your feet is a good practice to get into regardless. By getting the pressure under the plantar fascia, you're working out the trigger points without trying to make changes to the plantar fascia. Strengthen the muscles around the hips. When hips are weak, knees drop in and feet over-pronate. If you're over-pronating (heavily turning inwards when you walk), you're increasing pressure on the plantar fascia. So if you can strengthen the hips and the chain above the irritated area, you can relieve the pressure from the plantar fascia. Good exercises for the hips are clam shells, hip abductions, laying on your side doing leg lifts, and side planks. Make sure the hips are squared and stacked so that your glutes and core fire. Wear correctly-fitted, supportive shoes, for both running and everyday wear. Wearing hard shoes, or no shoes will only irritate the problem area. 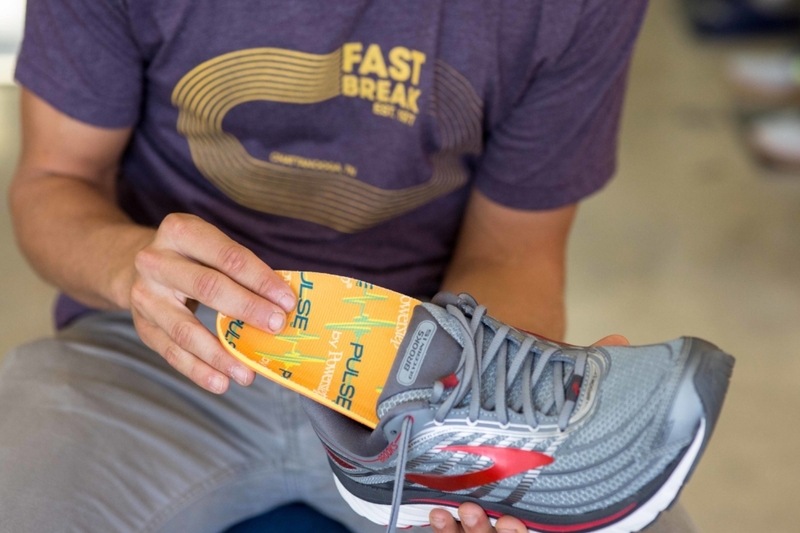 Shoes that are too small or too flexible will not allow the plantar fascia to heal. It’s worth the time, energy, and money to be fitted for a good pair of running/walking shoes. You will notice a difference. Of course, we are here to fit you for shoes at Fast Break Athletics! Wear an orthotic that supports the arch. If needed, additional support under the arch can be useful for holding it up so to relieve the tension from the plantar fascia when you step on it. At Fast Break, we carry the PowerStep. It is semi-flexible, and still allows your foot to go through its full range of motion, all while supporting the arch and relieving heel pain. We carry these for both running shoes, and casual shoes or work boots. Wear a plantar fasciitis night splint. Although it may look like a torture device, have no fear! A night splint keeps the foot dorsiflexed while you sleep, allowing the plantar fascia to heal in a stretched position to avoid the searing pain in your first step in the morning. We also carry these at Fast Break. This depends on how severe your case of plantar fasciitis is. Rebecca thinks that it’s pointless to tell a runner to stop running, so she aims to only keep a runner off his or her feet for 1-2 weeks if they absolutely need it. But it all depends on the body, feet, and person. Give your feet some rest while you do all of the above, then ease back into running. If you have done all of the above and still struggle with heel pain, consult your doctor about seeing a physical therapist to assess if there are weaknesses in the body or other factors that could be prolonging the pain. Stop by the shop if you have any other questions about plantar fasciitis!